It was an exciting weekend of the PassTime sponsored TRG team and driver Spencer Pumpelly. 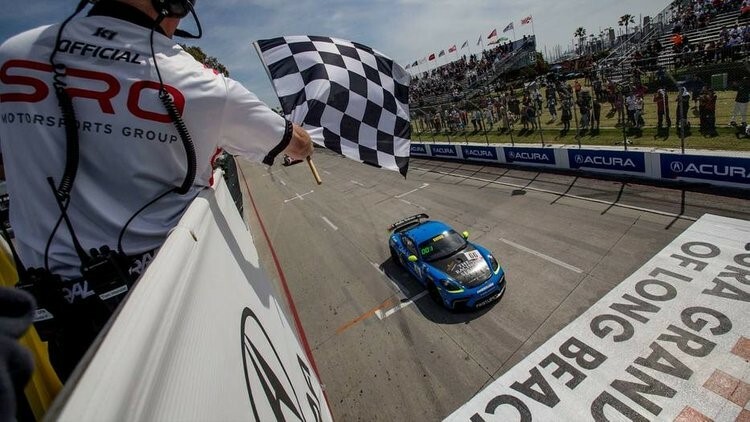 Pumpelly won victory in the Pirelli GT4 America Sprint race on the streets of Long Beach. Driving the No. 66 Porsche 718 Cayman GT4 Clubsport, Pumpelly took the win over No. 50 Panoz Avezzano GT4 driven by Ian James. This was Pumpelly’s first GT4 America Sprint race win of the season and has seen him take over the lead of the championship heading into next month’s double-header at Virginia International Raceway. Congratulations to Spencer Pumpelly, TRG, and Porsche racing! PassTime is proud to be apart of the renowned TRG team this year with some amazing drivers! will be driving a new, 2019 Porsche Cayman GT4 Clubsport MR for the Pirelli GT4 America SprintX East and West Races. Derek DeBoer has racing running through his veins. Derek’s grandfather raced in the local dirt car circuit and his father followed, albeit in Top Alcohol dragsters, racing in a straight line. Derek’s racing career began 17 years ago at Laguna Seca in a Formula Dodge. Derek has raced in the competitive Formula Renault open-wheel series and spent several years in the ST class of Grand Am. No stranger to the world of endurance racing, Derek won at the 2015 LeMans Aston Martin Festival race, had his first shot at the Rolex 24 at Daytona the same year, and has raced multiple times in the 25 hours at Thunderhill. He’s also competed in multiple Continental Tire Series races. Derek joined The Racer’s Group in 2013 and has been part of the TRG racing family ever since. He is always a threatening contender in the Pirelli GTS and SprintX categories, finishing 2nd in the championship in 2015 and consistently coming away with strong finishes, podiums, and victories and 2019 looks to be especially promising with two co-drivers and a full season covering the Pirelli GT4 America SprintX East and West races ahead of him. Dr. Rappaport’s passion for motorsports racing comes from his appreciation of the beauty of the cars, fascination with the technology and the challenge of perfecting every detail to win. He began racing three years ago with the Sports Car Club of America, where he met his now coach and mentor, Robert Orcutt, and was fortunate to win his first race in GT2 in a Porsche Cayman. He won his next SCCA race also and that was all it took to know this was something he was meant to do. Dr. Jim approached racing with the same dedication, focus and hard work that has made him such a sought after Spinal surgeon for the past 34 years and, with the support of Robert and the TRG team, his skills progressed rapidly and he quickly moved to the Pirelli Trophy Cup series last season. 2018 was a great year for Dr. Jim with a win in the GT4 category at Thermal, multiple second place podiums and a strong finish to the season in second place for the Championship! With such a strong foundation, it is no surprise that he is moving up once again to compete in the 2019 Pirelli GT4 America West races with his co-driver, Derek DeBoer. Sean Gibbons started racing later in life though he’s always had a strong passion for sports cars along with the focus, drive, and determination it takes to succeed as a driver. Sean graduated from the Skip Barber racing school’s MX-5 cup program and entered his first race in 2012 in the highly competitive PCA Spec Boxster class. He won rookie honors that weekend, finishing second in his first race. Since then Gibbons has put his car on the podium nearly 70 percent of the time and set a number of track records in both the PCA and NASA series. With only 8 professional races, he has been on the top step of the podium twice and a runner up once. In 2019, Sean will once again be teamed up with Derek DeBoer for the Pirelli GT4 America East races in the new, #17, TRG / Passtime / Lasalle Solutions 2019 Porsche Cayman GT4 Clubsport MR.
Spencer Pumpelly will be driving the new, TRG / LaSalle Solutions, 2019 Porsche Cayman GT4 Clubsport MR for the Pirelli GT4 America Sprint Races. Spencer Pumpelly was introduced to racing at a young age while watching his father contest the IMSA GTP Championship in a Ford Prototype during the late 1980s. In 1995 he enrolled in the Skip Barber Racing School and has since raced in many classes of cars successfully. He is a twenty-three year veteran of professional sports car racing and a two- time class winner in the Rolex 24 at Daytona and the 2016 Continental Sportscar Challenge ST champion. He holds multiple victories in IMSA, World Challenge, and Continental Challenge competition including class victories in six major IMSA endurance races and has appeared in the 24 Hours of Le Mans four times. Known as one of the most talented drivers in the sportscar racing circuit, Spencer is a highly sought after driver, coach, and race winning strategist. Spencer rejoined TRG in 2018 and is no stranger to success with this team. During his six-year-long relationship with TRG, Pumpelly was a fixture on the podium with four top-three finishes in the Rolex 24, a second-place at the 12 Hours of Sebring in 2011, two six-hour victories and more than a dozen wins and numerous podiums, across a variety of series including; Continental Tire Sportscar Challenge, Grand-Am, and American Le Mans. He also scored a podium in the NJMP ARCA NASCAR series and in 2011 brought home an epic GT class win (Pumpelly’s second) at the Rolex 24 at Daytona…with no clutch!!! 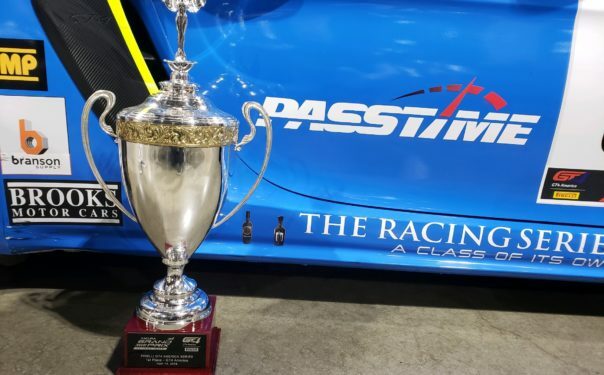 PassTime is proud to join the dedicated and successful TRG team for the 2019 season! PETALUMA, CA: The TRG team is set to launch the 2019 Pirelli GT4 America season with one of its strongest lineups to date. With three new, Porsche GT4 Clubsport MRs, competing in two classes, the team is prepared to surpass their 2018 PWC season. TRG welcomes the return of drivers Spencer Pumpelly, Chris Bellomo, Dr. Jim Rappaport, Derek DeBoer and Sean Gibbons to the 2019 season and welcomes Kevin Woods to his first season with TRG. A full season in Pirelli GT4 America means that guests and team supporters can expect an exciting calendar of race-weekend entertainment provided by the TRG business and hospitality crew. From private race seating and cocktails at The Dalí Museum during the Grand Prix of St. Petersburg to Adobe Road Winery dinners at Weathertech Laguna Seca, this experienced team truly knows how to throw a party! After the incredible sponsor and guest turnout during the National launch of our new wine brand, The Racing Series, in January, it is clear the group’s track record for blending racing and entertainment in new and exciting ways is continuing to draw potential partner/sponsors from all over! The Racers Group Founder and CEO, Kevin Buckler, had this to say for the 2019 full season entry, “It is fantastic to have a powerful two-car team heading into our first big event at Circuit of the Americas (COTA) in Austin and to be running three cars, with 6 such incredibly passionate and talented drivers, for the full season! We are gunning for two championships… One in PRO and one in AM. Derek and Jim are going to make a formidable duo in their first season racing together in the Pirelli GT4 America SprintX West races and will be sharing the #17 car throughout the season with Sean Gibbons, who we are excited to have partnered with Derek again this year for the Pirelli GT4 America SprintX East races. They are all terrific drivers, with great relationships with each other, which makes it even more awesome! Having Chris Bellomo back, with professional coach and long-time TRG partner, Robert Orcutt, is another major bonus. Chris is a talented driver and a terrific guy with so much potential and his co-driver, Kevin Woods, is an amazing addition to the TRG team. Having a driver like Kevin, who is not only fast, but just incredibly solid across the board, is the perfect complement to Chris and they will make a formidable team. We are excited to have such a great matchup with this pair and look forward to winning some races together! The return of Spencer Pumpelly to the TRG team for the Cal 8 Hours race in 2018 was big for us. Spencer raced with TRG for 6 years, starting in 2006, and having such a dynamic driver come back for a major race last season and then go “all in” this season says a lot about our relationships. We have such a strong history together, including several big GT class wins, so we know this is going to be an exciting year on the track. We are definitely running for a championship and hope to make Porsche proud. I often get asked what I love most about racing (and why I keep doing this) and I tell them that what is probably the most important thing to me is that all of the people who are with us throughout the year from our drivers, sponsors, and guests to our team members who keep things running behind the scenes, is that they are also my friends and our “racing family”. We have close relationships with all of the drivers and their families — moms, dads, spouses, and kids — and this makes the weekends just that much more special to look forward to. We are also thrilled to have Steven Robb and LaSalle Solutions back as a partner again this year. The company is a leading provider of IT life-cycle asset and maintenance contract management services, one of the largest Cisco resellers and the partnership with TRG focuses on strong business-to-business, co-branding and high-end corporate hospitality events. Steve totally gets it and is a “model” for other businesses that are looking to extend an advertising budget and are looking at motorsports. Many of the companies we have worked with say that this provided them with the strongest ROI of any of their marketing budget investments. I always say that the paddock is the most “fertile fishing ground” that you can find and Steve and I always find ways to partner with other companies to help them understand the wonderful benefits of the motorsports sponsorship and make sure they receive a solid ROI. He is amazing. We are also pleased to welcome back PassTime GPS as a season-long sponsor partner with Sean Gibbons and TRG. They make some amazing, cutting-edge, tracking devices that are really the rage right now and everybody should check them out! After the season opener in Austin, TRG will head to the Grand Prix of St. Petersburg for a weekend of action-packed racing and opulent hospitality including fabulous dinners featuring Adobe Road Winery and The Racing Series, intimate access to The Dalí Museum, and up-close access to the race team.